you have some interesting dilemnas ... an army that is powerful but vulnerable on supply (can you order up more supply wagons?) and the fear of a Dictator appearing. If the game stays static, presume you are going to lose in VP terms? how much could you risk splitting your army? If so an attempt to liberate the Etruscans could be a way to confuse and force your opponent to spread out in turn? I know you're concerned about being overpowered by the Romans, so my question is: are you leaving any units behind to safeguard Maleventum, or are you throwing the whole lot at Rhegium? Thanks for your comments! The AAR might be a bit boring over the next few turns but rest assured there will be action later on! I am a bit "light" on pictures again because there simply is not much to show. If instead of writing so much you want me to just post a screen of the map instead, tell me. I am happy to change my style then! Solemnace, yes, according to this post you can. The problem is that it is a level 2 fort which means it requires a siege. If I besiege it with too few forces the Romans will propably happily accept the offer to kill some of my units and if I besiege with too many forces it's good old supply problems again! Loki, supply really is the problem. My army has only 4 supply wagons - and even worse, one of those is of the Etruscans! That means if I hadn't shipped the Etruscans to the South I would have only 3 supply wagons for ~60.000 men. I think that is a bit weird considering that usually supply wagons are not such an extreme rarity in AJE. I remember that in most AJE scenarios you can build dozens of supply wagons? If it was only the Epirotes I would understand, but all the tribes from Southern Italy - Brutii, Samnites, Lucanians - neither have nor are able to build any supply wagons. It really prevents me from advancing at all. Since the supply wagons cover not even 1/2 of one turn I couldn't keep my army supplied during a siege. Unless there is some trick which i don't know! Yes, i would lose in VP if it stays like this but the difference is not that big (don't remember the exact values at that time of the game) and the scenario still takes long! A decusive battle makes more than up for the VP lost due to missing objectives. Also, if the war will expand to Sicily my objective provinces will change as far as I know and then everything will be different anyway! Stuyvesant, only the Brutii warriors are besieging Rhegium. Combat strength 600. More than enough for any siege. I can't assault anyway. Nothing significant happened. 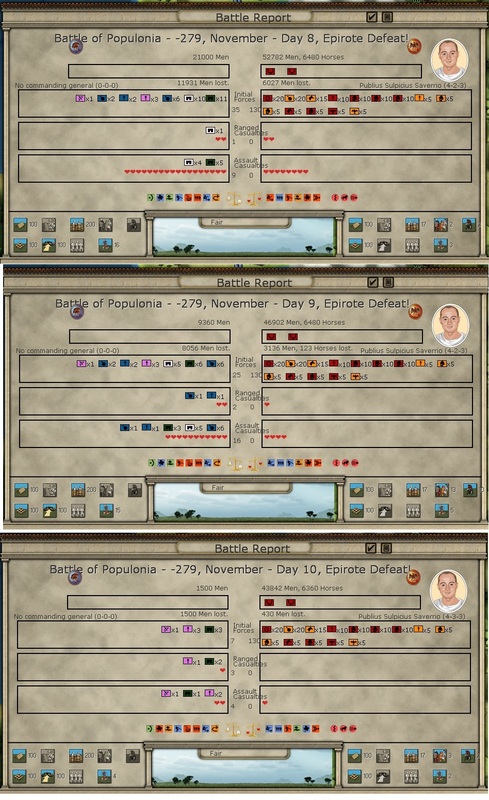 The Romans made a breach in Populonia already. It however seems like they have not built any siege weapons yet (unlike Alea Jacta Est, where siege engines are built pretty much immediately, in Birth of Rome depending on luck it can take quite some time until the legionnaires build any siege weapons), so I hope it will hold out for a couple more turns. Supply is not a problem because of the port, my garrison is still 100 % supplied. The question is thus only: when will the Romans make their second breach? Next turn already? Good news: the defenders of Populonia actually managed to repair the first breach again! However, eventually Populonia will fall that is for certain. 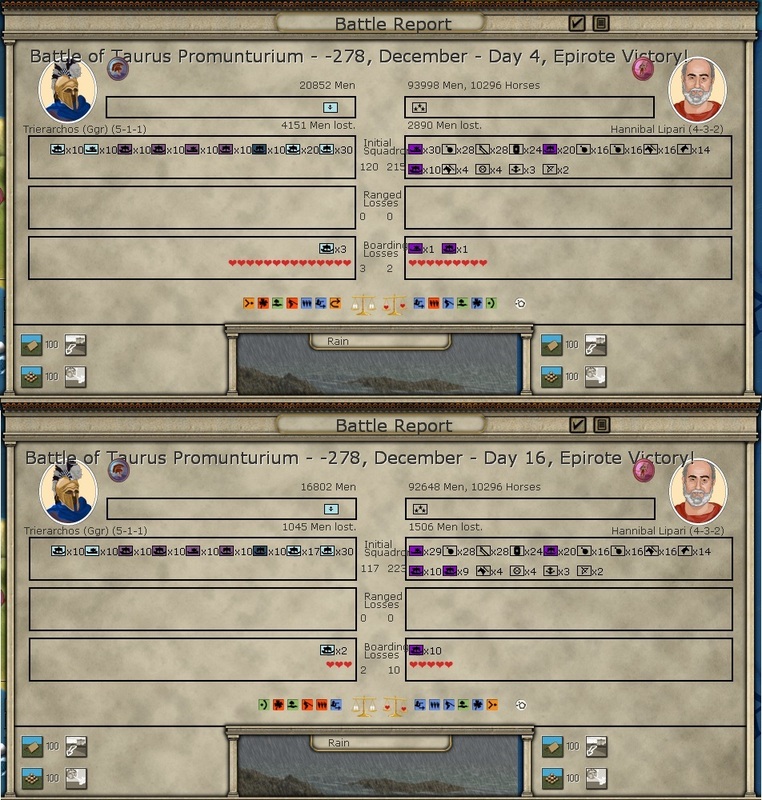 Initially I thought that I would keep Lollus' brigands inside Populonia to increase the Roman losses when assaulting, but there is always the danger that the garrison surrenders without a fight and even if that wouldn't happen, I doubt Lollus could inflict significant casualties to the whole Roman army (yes, everyone is besieging Populonia. Talk about successful baiting!). So I'm sending the Greek navy to pick them up. Meanwhile on the other side of Italy, the siege of Rhegium is still ongoing but not making any real progress. 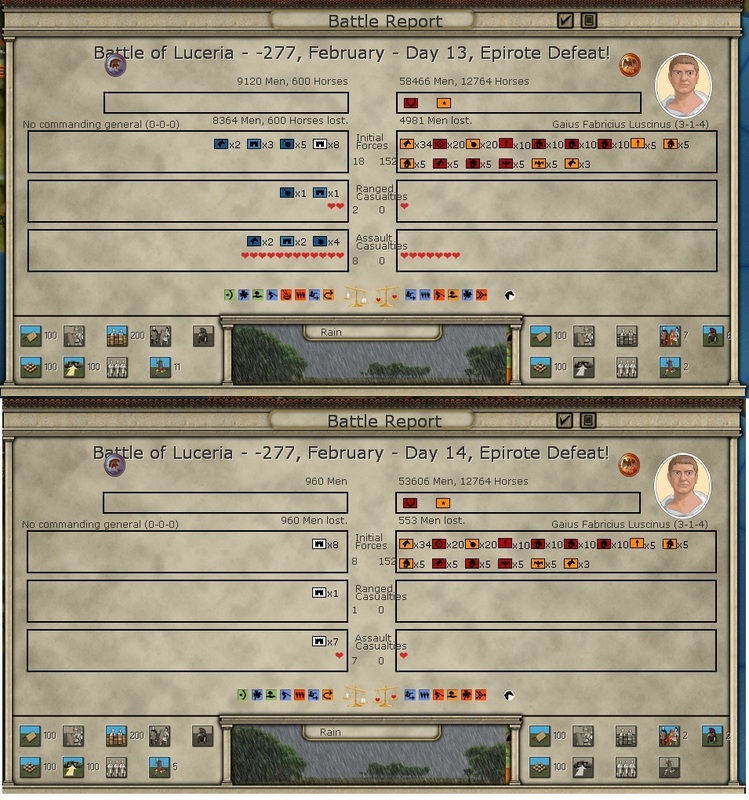 Two newly recruited Lucanian infantry units will join Pyrrhus next turn and should bring the total army strength to over 3000 (again). The last few months were quiet, with neither side willing to make any big attacks into hostile territory and this turn is no different. The Greek navy arrived on the coast off still besieged Populonia and Lollus and his troops are preparing the evacuation. The siege of Rhegium is also still ongoing without any noticeable progress, but it can't be long before the garrison surrenders. I can't say I have too many sympathies for these traitors! 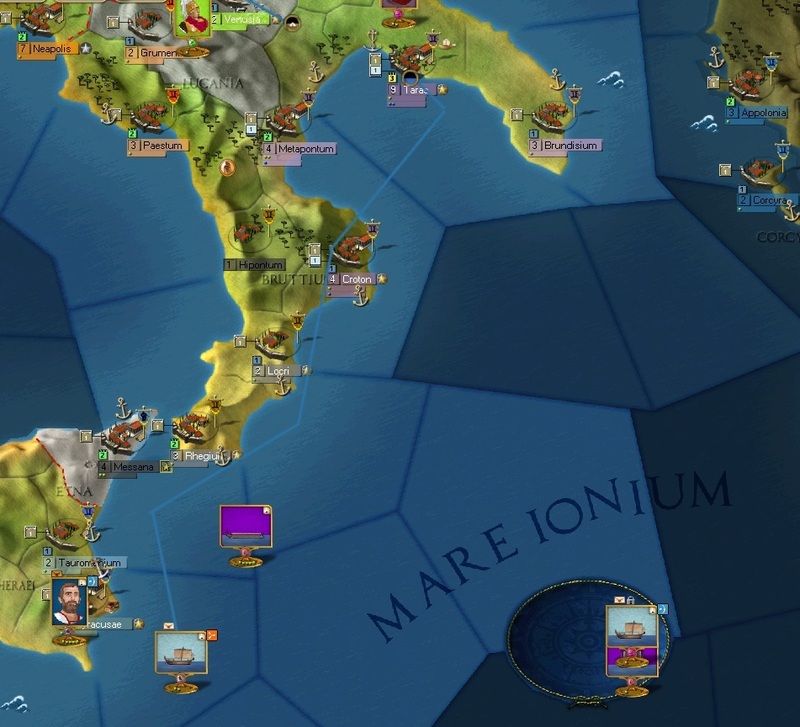 Nice job pulling all the Romans to Populonia. Now if only you could exploit their insistence to blob together in one place... Ah well, regardless, it should give you some breathing space in the south while the Romans while away their time in the north. 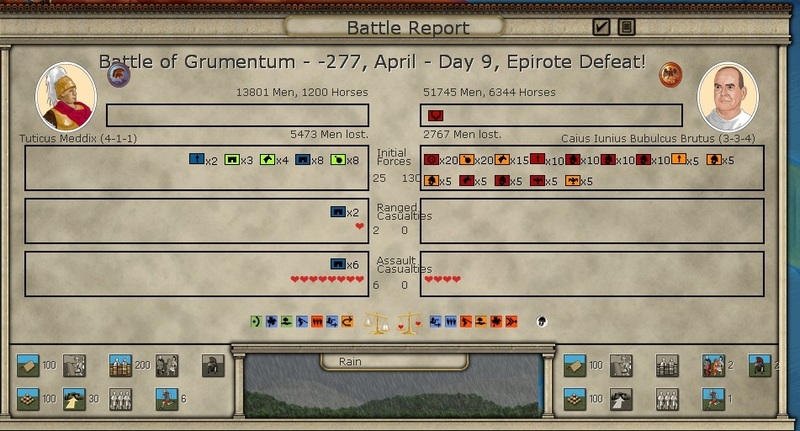 Is it too much to ask for attrition losses for the Roman army? Or does the AI get bonuses (or do the Romans actually know about the ancient secrets of supply wagon building)? Again a very uneventful turn. The siege of Rhegium is still ongoing, I would have hoped the mercenaries are thinking about surrender by now but it doesn't seem to be the case. 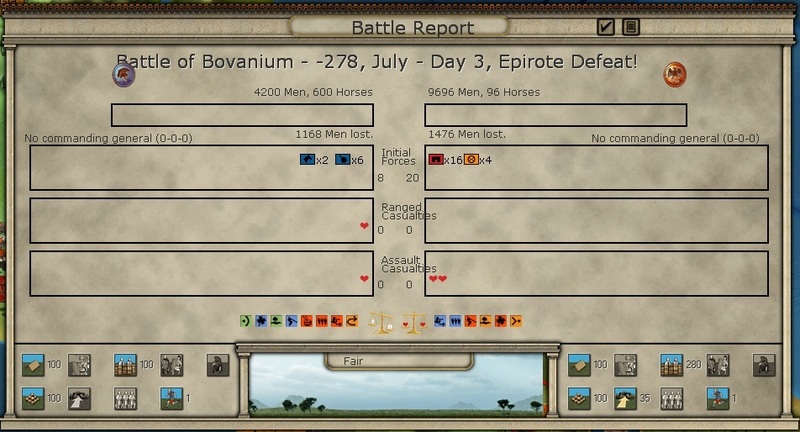 The Roman siege of Populonia has unfortunately made some progress, they have one breach of the two required now. Luckily they have also moved most of their army away from Populonia – bad timing for them! There is now only one legion and one Socii Alae keeping up the siege and while I am too weak to sally out I doubt the Romans will assault with only those two units in case they make a breach again next turn! That buys me some valuable time. My big hope is that the Romans will eventually decide to attack Maleventum again and that I can then reach them with my counter-attack. I can reach Maleventum in 7 and Capua in 10 days from Metapontum. I have no doubt that I could absolutely destroy the Roman army in a battle, even if I am the attacker. 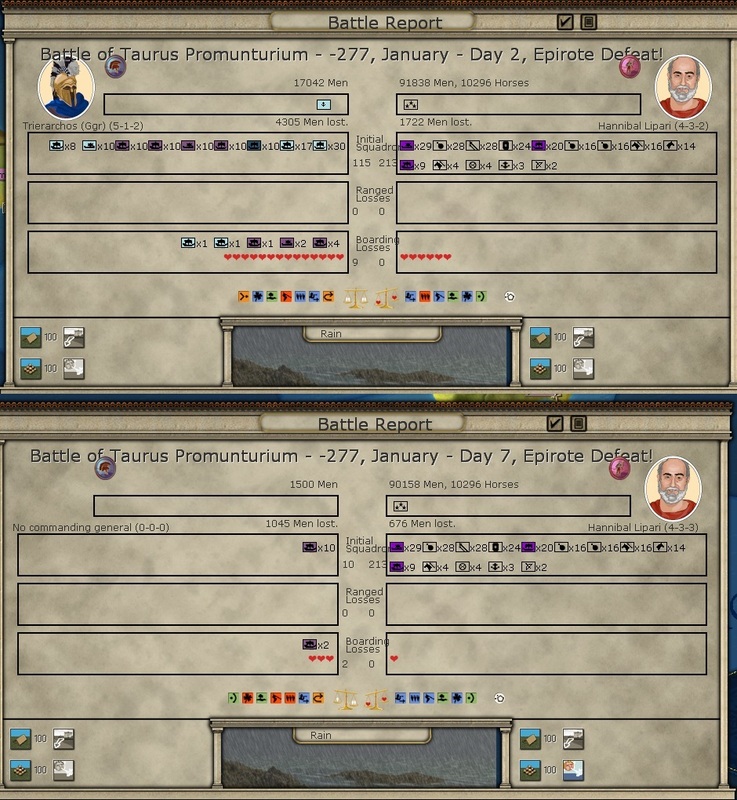 Together with Lollus' brigands Pyrrhus' army has nearly 85.000 men with a combat strength of 3200 now! And: the Brutii army with a strength of 600 is still in Rhegium! Am I too careful then, just staying in Greek territory? Propably! But right now my plan is to wait for the event that allows me to declare war on Carthage and then fight in Sicily. My morale is now at 99 while the Romans have 114 morale. That's not good as this means the Romans get a cohesion bonus. Siege of Rhegium still ongoing. Again not much to report, but at least I am making some "visible" progress in Rhegium: the dots indicating the status of the garrison became red! That means it is in bad shape now.. and will hopefully surrender anytime. What I am wondering about is when the option to go to Sicily will be unlocked. Hopefully as soon as possible! It resulted in a 65 VP gain and 4 NM gain for me – not bad! This substantially shrinked the VP gap between me and the Romans, it's now 275:335. The next action is now obviously: onwards to Messana! Anyway, I will propably send Milon (3-2-4) along with Lollus' brigands (as they have a 25 % move bonus in hills and Sicily is full of hills. But more on Sicily when the war there actually starts!). That should be more than enough to defeat the Carthaginians. The Romans are advancing again! They swept away the garrison of Maleventum. 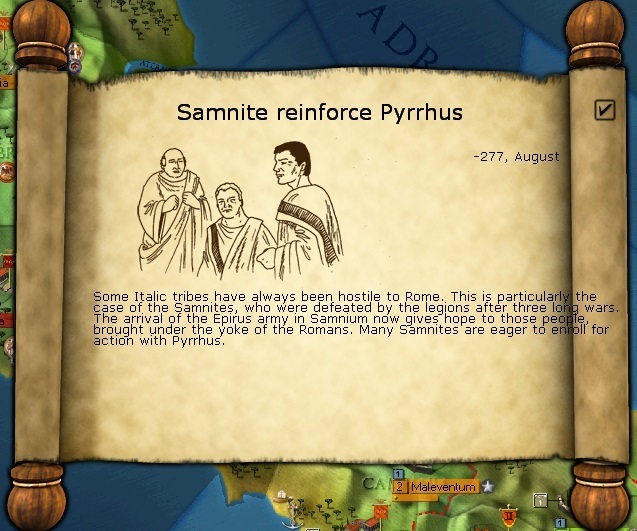 Pyrrhus will counter-attack immediately with his 3300-strength army. Unfortunately, it rains and will take 12 days until the army reaches Maleventum. There's no need for a screen as the situation is exactly the same as last time the Romans assaulted Maleventum. I would guess the strength of the Romans to be around 2500. That means I have superiority in combat strength, a big superiority in numbers and I have a military genius (as he likes to call himself) leading my army. The terrain is mountainous and while I certainly don't like that I also do not think it is of big advantage for the Romans. If it discourages their retreat – as I have experienced mountains do - fine! That means we can fight a battle of attrition that they cannot possibly win because my army is a very big lot larger! And because it is march my war chest is full! What could possibly go wrong? Pyrrhus is set to make an all-out attack into Maleventum. Mean as I am, this post ends on the cliffhanger! Stay tuned! Hmmm... what could go wrong? There's the small matter that rain reduces the frontage further. My experience at Messana of fighting legions in mountains is that power superiority doesn't do anything. Shocking news reach me: Pyrrhus has been defeated near Maleventum! Game over for the Epirote king?!? No, it was not the stunning victory that I expected but it is hardly a big setback, either! The army took some additional damage during the retreat but all in all it is still in excellent fighting shape. As – unlike the Romans! - no unit lost any elements my army should be full-strength again next turn, ready for a Roman counterattack should it happen. Rain and bad terrain certainly didn't give me the results I wanted. Driving the Romans out of Maleventum seems very unlikely now. But luckily, another big event finally happens this turn: Syracuse requests for Pyrrhus' assistance in the war against Carthage. I obviously reply favourably, happy to have some enemies that I can hopefully actually beat! Before you wonder why I would weaken my army in Italy for Sicily when I am not even winning: I am not sending a single unit to Sicily! 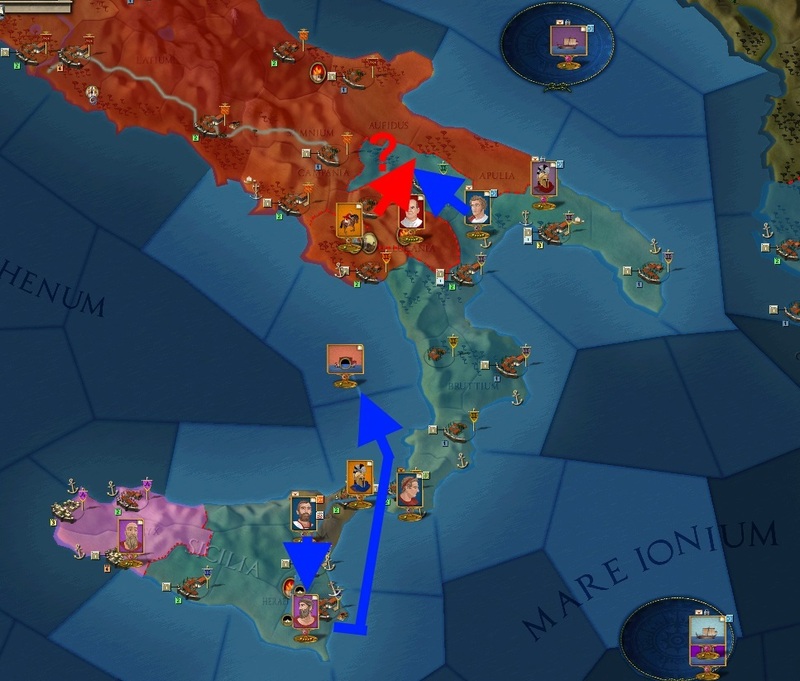 The Syracusaen forces together with the Brutii warriors that are currently besieging the mercenaries in Messana should be enough to at least hold out in Sicily. I am also not sending Pyrrhus himself to lead in Sicily but Milon (3-2-4). He's not a great general, but he will do. Next turn I will show you the situation in Sicily and the changes in victory provinces! 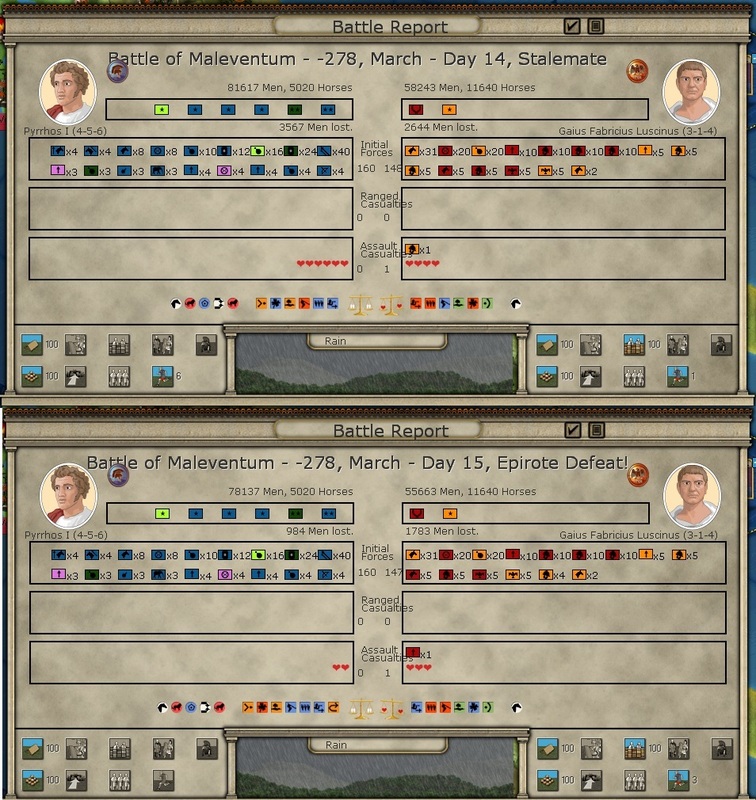 The Romans decided to stay in Maleventum and Pyrrhus' army is at full-strength again. But now for the important part: Carthage is now officially our enemy! This opened a new theatre of war in Sicily! 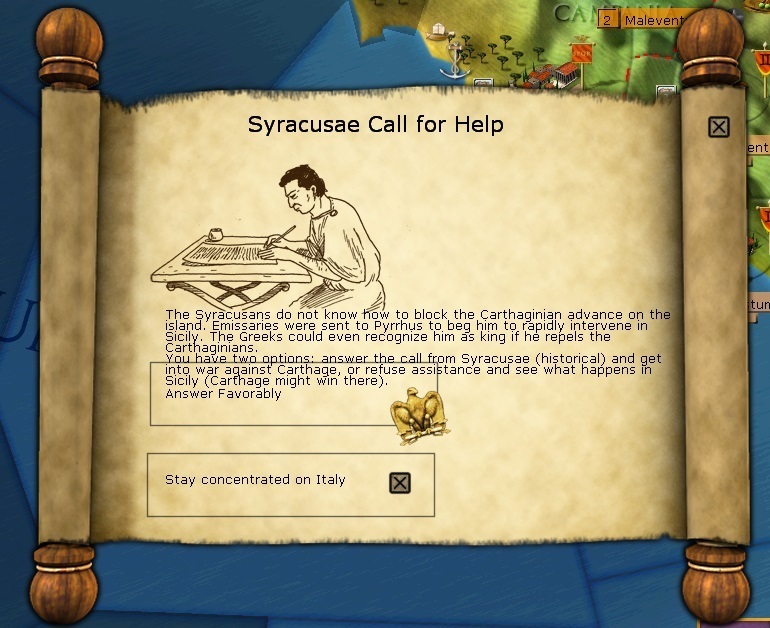 According to the in-game description "It is absolutely essential to save Syracuse by seizing the Punic territories of Sicily and – why not? - take Carthage." Sounds like a plan, doesn't it? But what actually happened due to the declaration of war? Here is a beautifully drawn picture (if I may say so myself) that shows you everything important! The coloured provinces are the objective (victory) provinces, although only Lilybaeum, Acragas and Syracuse are my objective provinces! Messana is an objective for the mercenaries and Panormus is an objective for Carthage only but not for me. This should be interesting now in Sicily. Simple Solution to blame away the defeats. Bad weather, rough Terrain and A Roman Leader Almost as good on defense as Pyhrros is on attack. They are clearly cheating to use such foul tactics against the Noble Greeks. With Milon and the two Syracusean armies merged, their combat strength is 1082. Once the siege of Messana is finished I can include the Brutii warriors into the army as well which should raise the strength to around 1700. 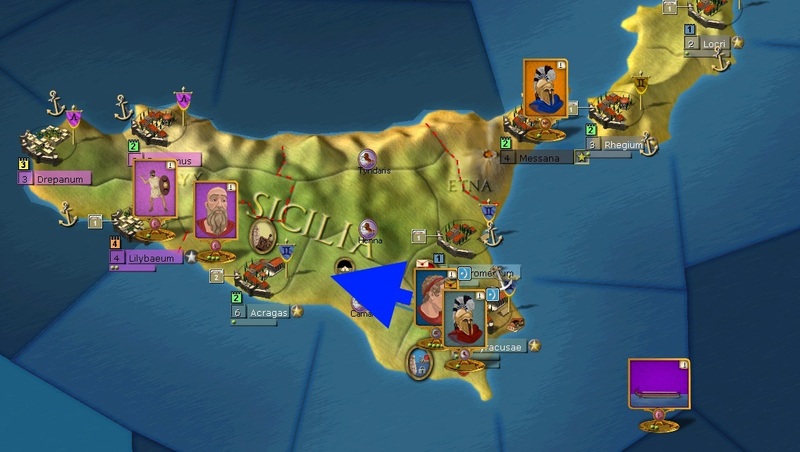 I have no doubt that this army will wreck anything the Carthaginians have in Sicily! Their army is still sitting in Lilybaeum. I might consider besieging one of their other forts in Sicily to lure them from Lilybaeum. This would also have the nice side effect that if they attack me I would know what I am actually up against... but I will only be able to do this after I took Messana. The Carthaginian fleet seems to have left the port of Lilybaeum. I have no idea where it has gone, but I am a bit scared that they will go for my fleet that is currently blockading Messana. 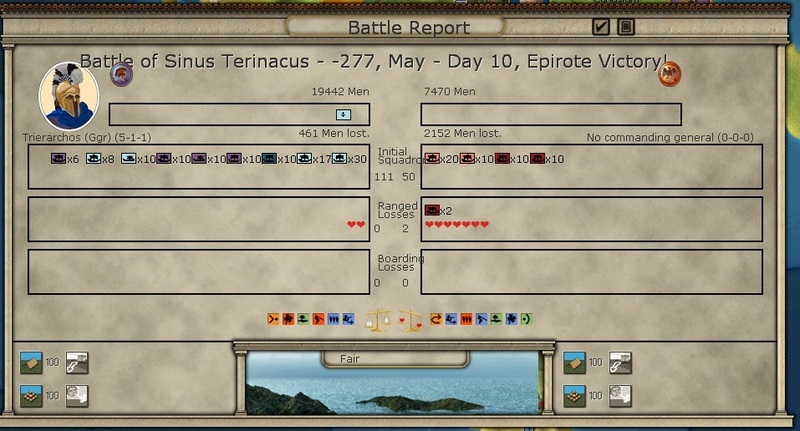 Trying to win against just a small part of the Carthaginian navy is propably futile. This is why I will only leave a single unit blockading Messana. It is still enough to keep the blockade up and at least this means I can only lose one unit! The rest of the Greek navy will move to Syracuse and join with their fleet. I also got two new options, although I have the EP for neither: I can recall my son Ptolemy from Epirus as a general and I can request the tyrant of Tauromenium, Tyndarion, to send his troops. They consist of a one-star leader (2-1-1) (Tyndarion himself), one rather strong hoplite unit, one experienced warship squadron and two transport ship squadrons. Meanwhile in Italy the Romans are still encamped near Maleventum. I don't want to advance – why would I need to, I get more VP/turn now, let the Romans advance! - and so we are just staring at each other. To spice things up a bit, I will send one Lucanian infantry and one cavalry unit to Bovianum to besiege it. I can't incorporate them in any armies anyway as I don't have the command points for them and for the CP they require they are pretty terrible. Nothing really happened. The siege of Messana is still ongoing and the colour of the garrison is now orange, which means it is out of supply and should surrender very soon! The Lucanian troops are laying siege to Bovianum, but they certainly won't last long. I don't want to spoil or anything, but I can guarantee you that the boring stalemate of the earlier war is slowly coming to and end! This is turning out be my most fun and exciting AGEOD PBEM game yet! I just noticed that I can't buy replacements for Lucanian troops, so these battered units (they didn't actually lose any elements!) will stay in Luceria. In Sicily, I am still waiting for the siege of Messana to be over before attacking the Carthaginians. Once both the troops from Tauromenium and the Brutii warriors besieging Messana are merged with the main army in Sicily, I will move against the Carthaginians. Because I seem to have accidentally set the navy blockading Messana to a passive posture, the blockade was lifted and the mercenaries in Messana are fully supplied again. So we're basically at the beginning of the siege again. I think it's not worth tieing up all those Brutii units in Messana for so long again, so instea everyone will now move to Acragas, merge with Milon's army and then attack. I just hope the weather will still be good then. I should have no trouble keeping up the siege itself during the winter as I have a very good supply situation with Acragas providing a lot of supplies. Meanwhile, in Italy, the Romans have rebuilt the walls at Maleventum. I don't want to attack right now anyway since I might need the money for replacements in Sicily so this is of no real concern to me. Otherwise, all quiet in Italy. The Carthaginians are coming! They seem to be in the process of landing near Syracuse! Luckily, they have not managed to unload their troops yet. the army is escorted by a rather small fleet only: 3 Quinquereme squadrons and one Trireme squadron. Considering that my navy consists of 2 Quinquereme squadrons, 2 Trireme squadrons and 3 Liburne squadrons I should be able to win it even if the Carthaginian fleet is more experienced and better led by their admiral Hannibal Lipari (4-3-2). Just for those who haven't played AJE: the three ship types Liburne-Trireme-Quinquereme are the three basic naval units of the game. A Trireme is stronger than a Liburne and a Quinquereme is stronger than a Trireme. There's a lot of factors in your favour here. Even if they succed with the unloading operation, Mago has a penalty for going out of Africa, they have an amphibious penalty, and a loss of cohesion from being onboard for a while. So this will continue now with turn 34 so the numbers are correct again. I think an apology is in order. They actually held off one Roman and one Socii legion! Meanwhile, it seems the Carthaginians were not aiming for Sicily after all with their invasion fleet. My fleet will move up the coast all the way to Taras in an attempt to catch the fleet whereever it lands. It might go all the way to Brundisium but I don't want to take the risk considering that there is a storm brewing in the region. The only thing I am worried about is that my fleet will be too exhausted and low on cohesion by the way it actually encounters the enemy fleet. On the other hand, they should be exhausted as well, after all they even come all the way from Africa... and in the end, if they land in Italy, Pyrrhus should take care of them easily. Milon will stay in Syracuse for now because of the bad weather conditions in Sicily. A march back to Acragas would take 38 days! What, the year is over already? Unfortunately there is no real cause for celebration. It might look like I have the superiority but unfortunately my cohesion is extremely low right now. Ships that are at sea with offensive posture lose cohesion every day while ships on defensive posture do not. 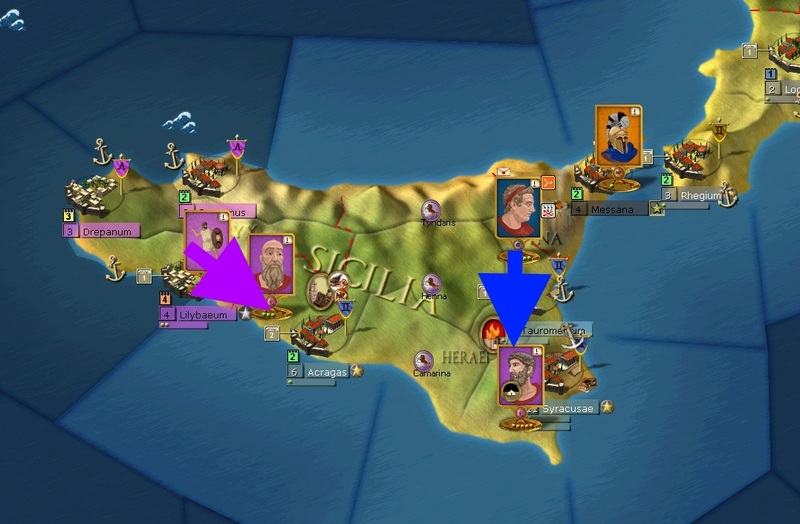 It seems the Carthaginians – cleverly, I got to admit – kept defensive posture to keep cohesion up. I couldn't, because then there would have been no battle and the Carthaginians could have happily unloaded their troops. At least I still have one fresh Trireme squadron stationed in Croton which will rush to attack the Carthaginians as well. Meanwhile, heavy snow in Northern Italy prevents either army from moving if it does not want to suffer from severe attrition. bit worrying as to where they are off to ... maybe they fancy invading Rome? In a couple of PBEMs (admittedly with WiA) we found that being the defender in naval battles gives a critical advantage, transports in particular defend fairly well but can't attack, so keeping to a defensive stance can boost your overall combat power. How exactly do storms work in AJE? 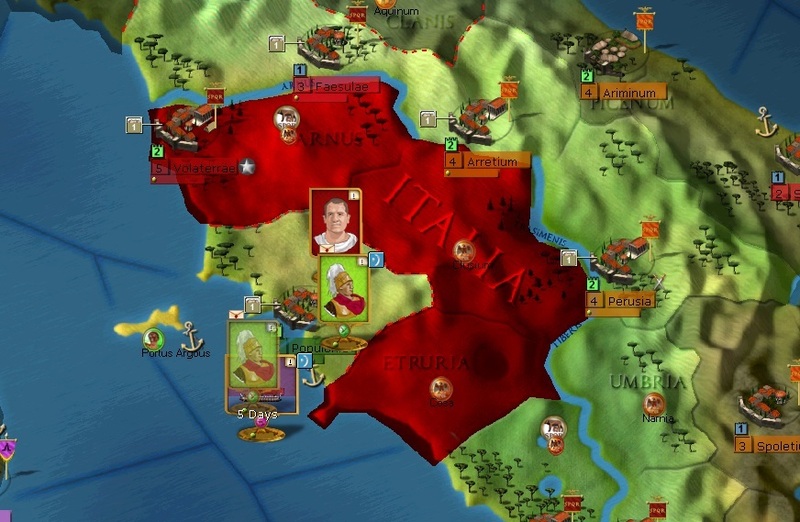 Do you simply lose cohesion, or is it possible the storm will destroy all the Carthaginian troops? Loki, remember that the Romans are "allied" to the Carthaginians at least in a "enemy of my enemy is my friend but a few years later we will fight anyway" kind of way. Unfortunately my naval victories are not to stay. Gen. Monkey-Bear, storms make you lose cohesion and ships (ie strength of squadron elements). Can be very deadly! In AJE I lost complete fleets to storms a couple times. But I think they made storms a bit weaker with a recent patch. This might just be the worst month of the war... yet? And as if that wasn't worse enough, I lose 8 more squadrons through pursuit afterwards! Considering all that it is surprising that my navy survived in so large numbers. Safely in the Syracusaen port are currently 12.000 sailors in 364 ships. Still: right now, the Carthagninans own the seas. In about a year I will hopefully be able to contest naval superiority again. Question is of course: will it still matter then? The Carthaginian army will propably land next turn. Pyrrhus will have to immediately move against them once the snow is gone and then immediately move back before the Romans get any ideas. There seems to be only a single general – Mago (4-3-3) – commanding the Carthaginian army. If Mago has the same stats as in the Punic War scenario then it should be rather easy to defeat him: he is not a bad commander but when he is outside of the African theater he will get a huge penalty to his stats. Still, I am certainly a bit worried now... two very large armies on Italian territory, that can't be good. Cineas diplomatic embassy to the Romans is a failure. They reply, they only accept a military defeat. Well, they can come get one then! How can I defeat them if they just stay in Maleventum! I'm also recalling my son Prolemy from Epirus. But I forgot to take a screenshot of both events! Recalling Ptolomy is a good move. Decent 2 Star leader though you lose a couple of worse 1 stars. Shame about the Navy their is a reason the Punic navy took some beating in the First Punic war. Sorry for the long delay, but finally the war continues. Solemnace, yeah he will show his worth. This is a chaotic turn! The Carthaginians finally land – in Sicily! I don't want to counter-attack, better let them come to me! This means Tauromenium will propably fall next turn. 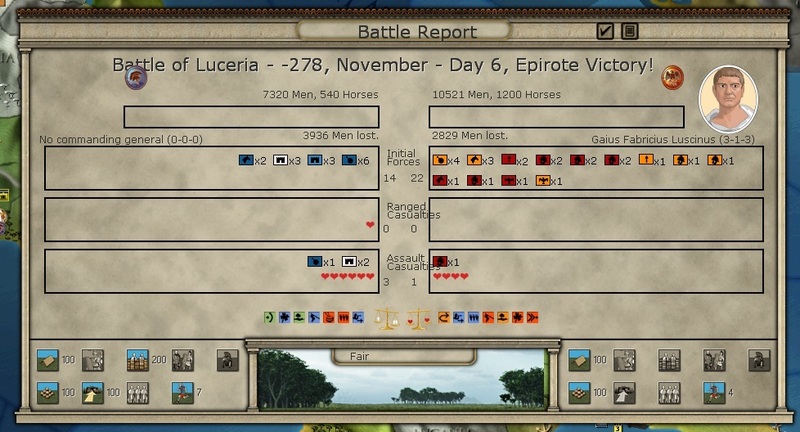 Meanwhile in Italy the Romans have assaulted Luceria with all their legions... this time, the Lucanians had no chance to hold out! In revenge for the defeat the Romans suffered three months earlier they were slaughtered to the last man. Pyrrhus can only move back to Metapontum and drive the cavalry army out of there. He only has enough supplies for one more turn – yes, you heard right! Pyrrhus' army can't keep supplied in Venusia. Unfortunately, he is also unactivated this turn – great timing! Meanwhile, his son Ptolemeos (3-4-3) (2 stars) arrived from Epirus. 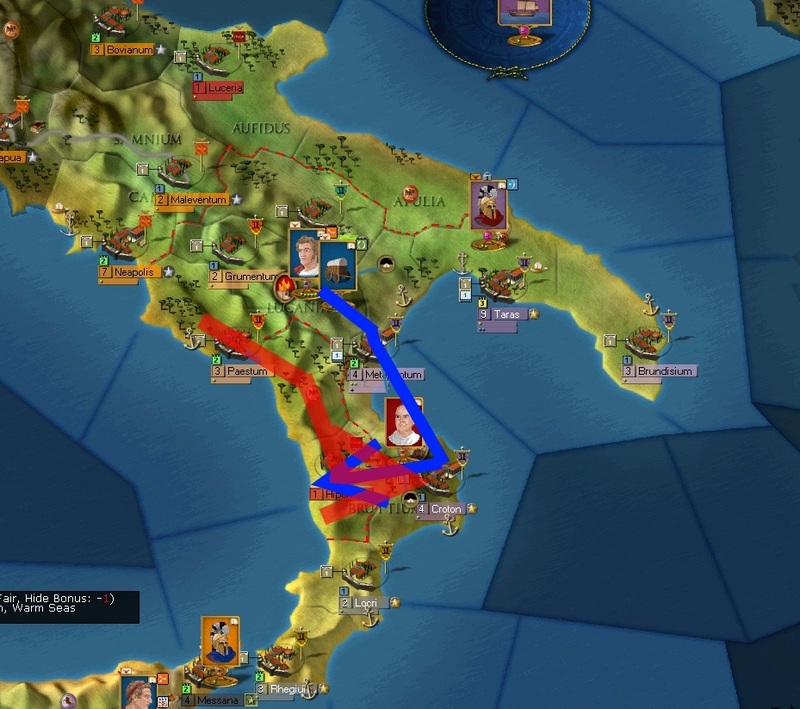 He will replace Milon in Sicily – while he does have a lower defense rating, he has a way higher attack rating and he also has a great trait: "Brave" gives a cohesion bonus of 10 to all unit under his command. (note: I later noticed that it actually seems to be deactivated in the game, maybe a dev can say why that is the case? Makes Pyrrhus and his son a LOT worse than they should be IMHO) His "hotheaded" trait makes him never retreat in the first 2 rounds of combat, but since I don't plan on retreating that should hopefully be no problem! Unfortunately the Carthaginian ships blockade the trait to Sicily so he has to move to Rhegium only for this turn. Speaking of ships, my navy has already recovered a lot of its strength! It's now at 502 ships (from 364). A very interesting battle occured in Tauromenium: the 3300-men garrison holds out against Magos army – that has only 57.000 men! First of all, it's very surprising to me they managed to hold out! This might be mostly because first of all as mentioned Mago should get a penalty in non-African territory and secondly because – as you can see in the circled number – only 29 % of the army were supplied during the battle! That might also explain why the number of men is so much lower – remember, over 80.000 men were in the ships originally! It seems they went ouf of supply from the several turns at sea. This is of course great news, and since they didn't take Tauromenium they will be unsupplied this turn as well. Milon will immediately counter-attack, now is propably the best chance he has of defeating this army! The terrain is clear, so that's good, but it (still) rains so it will take 13 days for Milon to arrive. The Roman navy is blockading the Messana strait. I could attack them as they are way weaker than my restrengthened squadrons but I don't really care right now anyway. 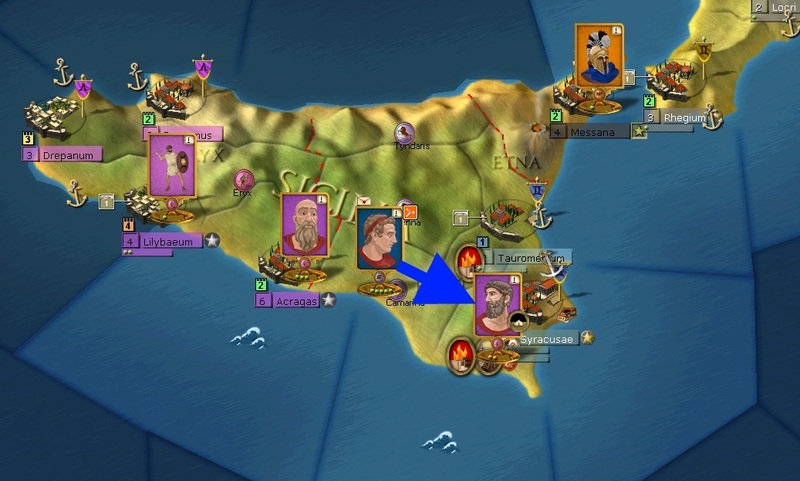 I would have liked to cross the strait with Pyrrhus' son and use him instead of Milos as general in Sicily, but now it's too late because I need to attack next turn before the Carthaginians take Tauromenium and resupply. Meanwhile in Italy, Pyrrhus arrived in Metapontum and chased the Roman cavalry off, unfortunately it escaped unharmed. Would the "Brave" trait perhaps apply only if he took personal command of a unit, and only to the elements in that unit? Well, it says "(disabled)" in the description - I first thought it was only "disabled" when the leader is unactivated but it seems that it is disabled all the time - so I assume it does not work at all. Perhaps your naval battles really did wear down the Carthaginian troops? I mean it sounds like a nice story . . . despite a few naval victories, their army was defeated before it even landed on Sicilian territory! I really can't imagine how they could escape now. I think they were just weakened because they had no supplies on these ships for at least 2 turns. When units are unsupplied, they take huge attrition. The Carthaginians were defeated in two consecutive battles! 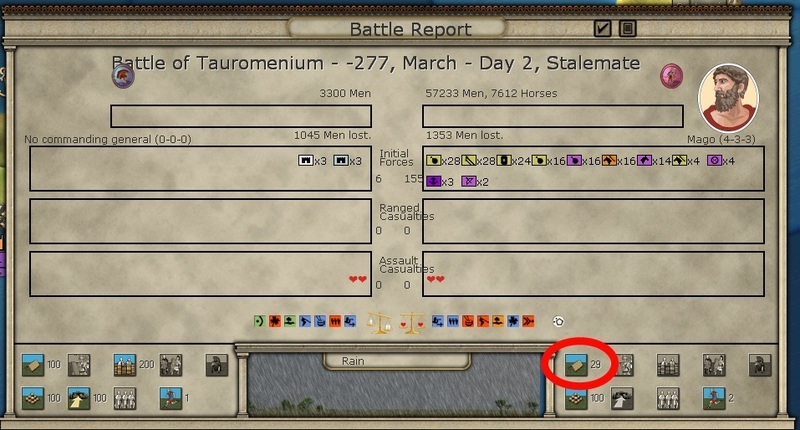 Weirdly, this time around 62 % of the army were supplied... it seems that they got quite a good amount of supplies from the countryside of Tauromenium, I wouldn't have thought it provided them so many supplies. Either way, they had no real chance. As you can see on the map they "retreated" to Syracuse. Milon will attack again next turn. This army is a great chance for me to get more Victory Points! Current situation is 550 (me) – 621 (Romans). Both of us gain 19 VP per turn. It may seem like a rather large difference, but one large battle can tip the balance already. The Samnites were set to retreat when engaged and luckily they successfully retreated and took virtually no casualties. They are now joined with Pyrrhus' army, bringing it up to 90.000 men and a strength of 3700! A counter-attack into the mountanous terrain of Grumentum is a bad idea so I am sending Pyrrhus to Venusia. My hope is that the Romans will attack this province next thinking that Pyrrhus will stay in Metapontum. Even if they instead go for Metapontum itself (which I doubt however, considering that they know very well that they would have no chance against Pyrrhus), I could simply counter-attack next turn. A battle in Metapontum would be like a dream come true because it is clear terrain and I could use my huge numbers advantage. But the Romans are propably not stupid enough to attack Metapontum.. let's hope they are at least stupid enough to attack Venusia! Also of note, the Romans are currently besieging Rhegium with a large cavalry force and they are also blockading it with their puny little navy. The Greek navy will show them that we still rule the seas! The Romans certainly got a bit overconfident with their little boats and we showed them that they don't even need to try. The remnants of their navy have retreated to the Messana-Rhegium strait and I hope I can catch them and force to battle again before they get back to safety. 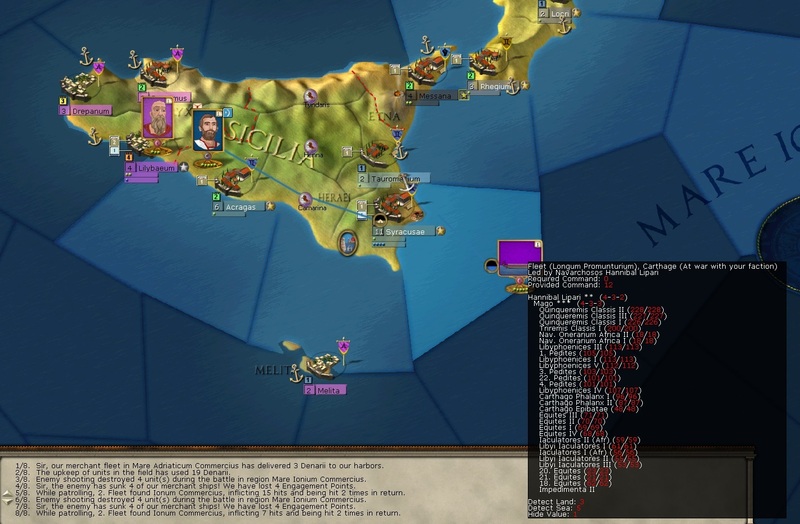 In Sicily the Carthaginians have unfortunately managed to avoid any major losses. While Milon's army is in Syracuse now, the Carthaginians in turn retreated to Tauromenium. It's a bit of a back and forth. Pyrrhus' son Ptolemeos (3-4-3) finally arrived in Sicily and is now commanding instead of Milon (3-2-4). Milon might hold a little grudge now – he isn't even allowed to command parts of the army because he has a higher* seniority than Ptolemeos and thus Ptolemeos would serve over Milon! Unfortunately, the Romans have not fell for our "little trap" in Italy. They are now besieging Paestum with their entire army. At least I can retake the fort that the Romans took from me last turn, Grumentum. 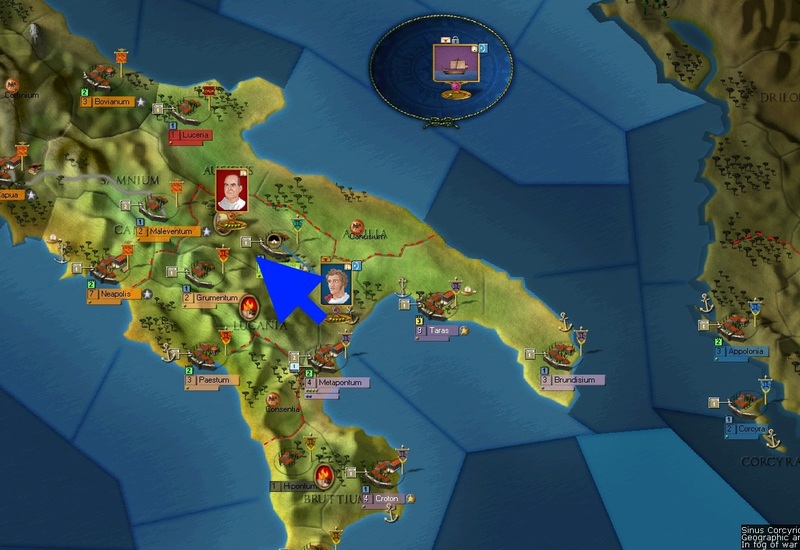 It won't use me much – the Romans get more than enough supplies from Neapolis anyway and Grumentum provides no VP – but on the other hand, there's no reason why I should not do it! 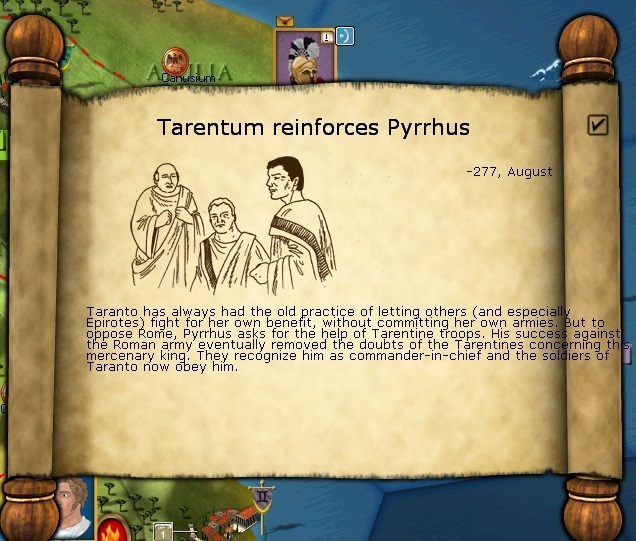 Pyrrhus has 46/60 experience points necessary to advance another level (he has already advanced two), so every little bit of experience counts! It also gives me the choice to attack the Romans in Paestum the turn afterwards. Yes, the last attack on the Romans got defeated, but it was in mountanous territory and it rained. In Paestum on the other hand, it's "only" hilly and the weather is great. So, I think my chances wouldn't be too bad... unless the Romans chicken out of course! *In game terms, he technically has a lower seniority – a seniority of 1 to be precise. Ptolemeos has 4. The leader with the highest rank and lowest seniority number always leads an army. Both the Romans and Carthaginians are on the move yet again, however that both the Romans and Carthaginians are very reluctant to engage me! I can't blame them, considering how powerful I am and all! 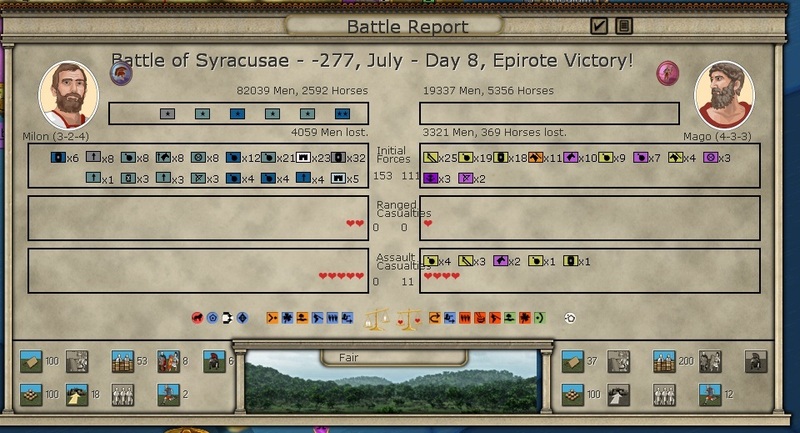 the other Carthaginian army has finally advanced as you can see. Acragas is under siege and will propably not hold out very long as it has no port and the garrison is thus out of supplies. Because it is now in friendly territory I can also see the units this army contains: it is mostly mercenary infantry, both Gallic and Iberian. I definitely am a bit scared of these tough warriors! However, I still move against the Carthaginians in Syracuse first. 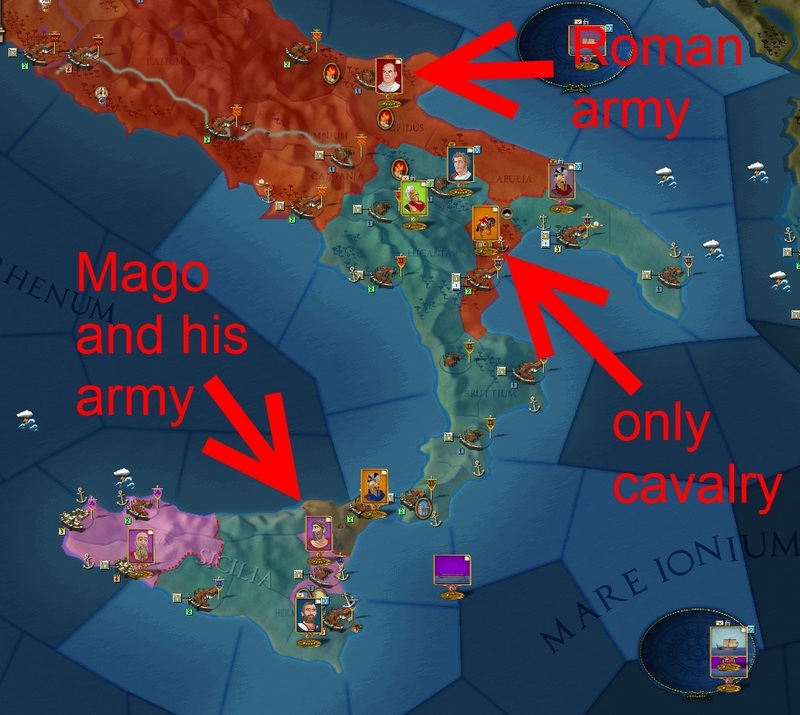 Mago's army there certainly is no real threat anymore – it didn't even gain military control of the Syracuse region, which means it is in passive posture! That passive posture allowed it to get away from my army this turn but it also means it gets no supplies at all and that again means it is losing lots of soldiers every month with no possibility to replace them. I think if I can finally engage them now I can wreck them once and for all. I just hope I will catch them! As you can see the Roman army moved away from Paestum. They took Hipontum (no assault, there was no garrison nor a fort) and are now besieging Croton. Pyrrhus will counter-attack immediately. 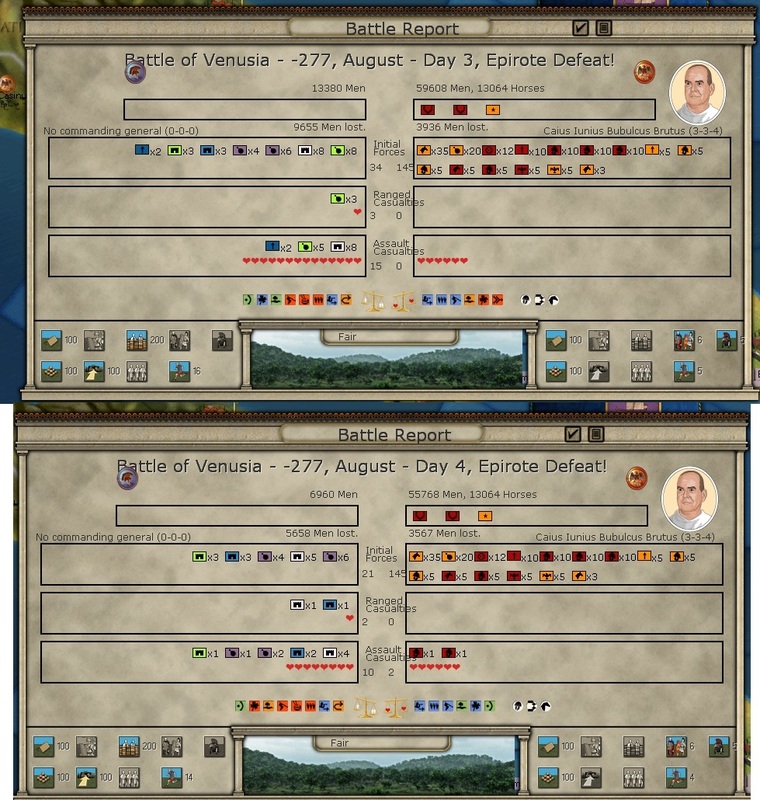 Unfortunately, the Romans show that they are not stupid: instead of going for the "clear" terrain Metapontum, they went for the "hilly" terrain Croton... but: if the Romans assault Croton this turn, they will be in "assault" posture which means they will get no defensive bonus at all in this region when Pyrrhus attacks them. And while I would like "clear" terrain to show my numerical superiority, it's not like the Romans are great mountain fighters, far from it! On the other hand, I actually do have a few units that get a 25 % bonus when fighting in mountains! So, my hope is to inflict some considerable amount of casualties on the Romans and force them to go back to their own territory. Also, note that I am eventually sending Pyrrhus to Hipontum. I do this in case the Romans decide to retreat instead. A lot of good news this turn! In Sicily, I defeated the Carthaginians yet again and killed a substantial amount of elements, giving me 1 more National Morale (now 105). Don't be confused that it shows Milon as the commander. It seems the game in the battle screen always shows the highest-ranking general in the province as commander and lists all units in the province in the "Initial Forces" screen. With other words: it was neither Milon commanding the battle nor did the city militia take place in the battle even though they are shown in the screen. Ptolemeos, who really commanded the battle is now a (3-4-4) commander, meaning he got better on defense. 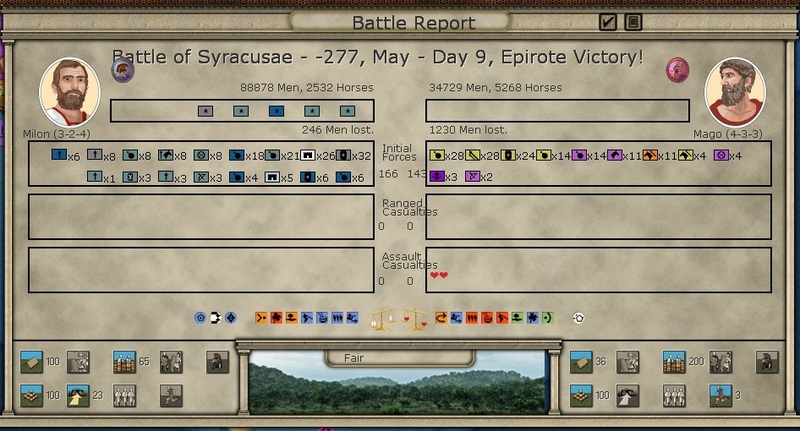 Also note how low the Carthaginian numbers are! I hope I can force the Carthaginians to battle again next month... it also provides me with valuable Victory Points, it's now 638 (me) – 670 (Romans). Only 32 difference! But that's not where the good news end: the Romans have retreated back all the way to Maleventum, which means all of Northern Italy is mine again! On the other hand, I don't know if I really should be happy about that or sad. The Romans know that they stand no chance in a battle against me unless it has conditions very favourable to them. This means my huge army is right now not much more than a deterrent. Will I ever be able to force the Romans to a decisive battle? Pyrrhus moves back to Metapontum. And another good news, the Tarentines finally allow me to use their army. 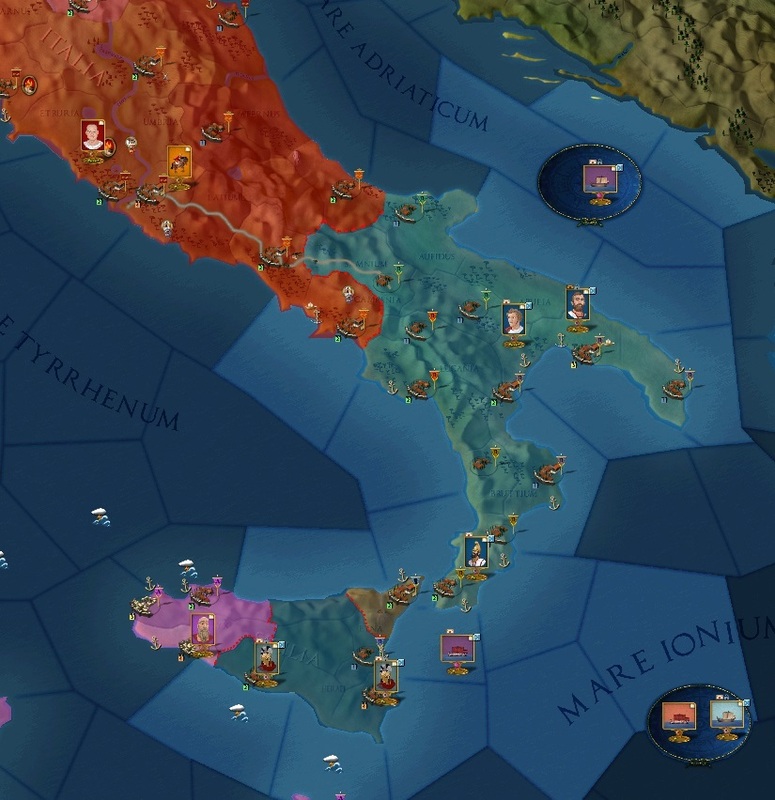 I want to eventually ship them to Sicily, but I am scared to transport them right now because there is a very large Carthaginian navy near Sicily. In game terms, it's one Samnite infanty and three cavalry units I can recruit. 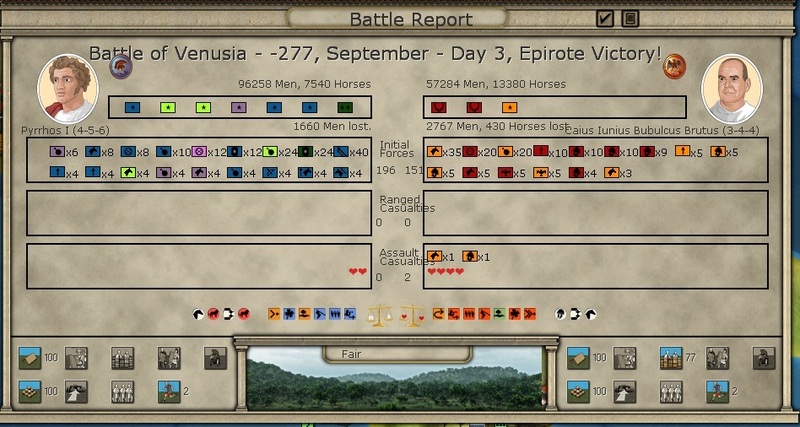 Not a lot, but the Samnite infantry units are great fighters and every unit of them is great news! I immediately start recruitment of the Samnite unit in Grumentum. 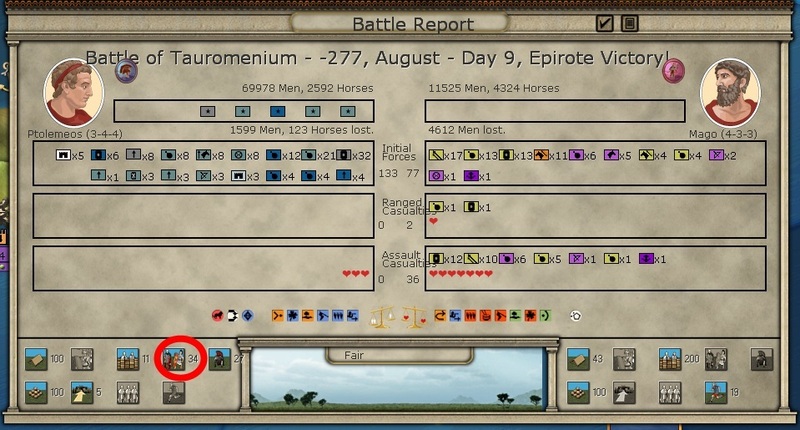 Of course, the Romans could assault that any day and destroy the unit in recruitment. But that's a risk I can take. As I have a substantial amount of money right now I am also recruiting a new Greek Quinqueremes unit. Even though a naval victory over the Carthaginians would not be of much use, it's a matter of honor now!! Nice work against Mago's army. Hopefully the second Carthaginian army is just as easy! By the way, I don't think I understand this: Did you ever capture Messana, or is the siege ongoing? From the last screenshot, you can tell there's border lines (in dashed red) around Messana. So it's still under siege. Long turns with much happening right now, although I am propably a bit too detailed. 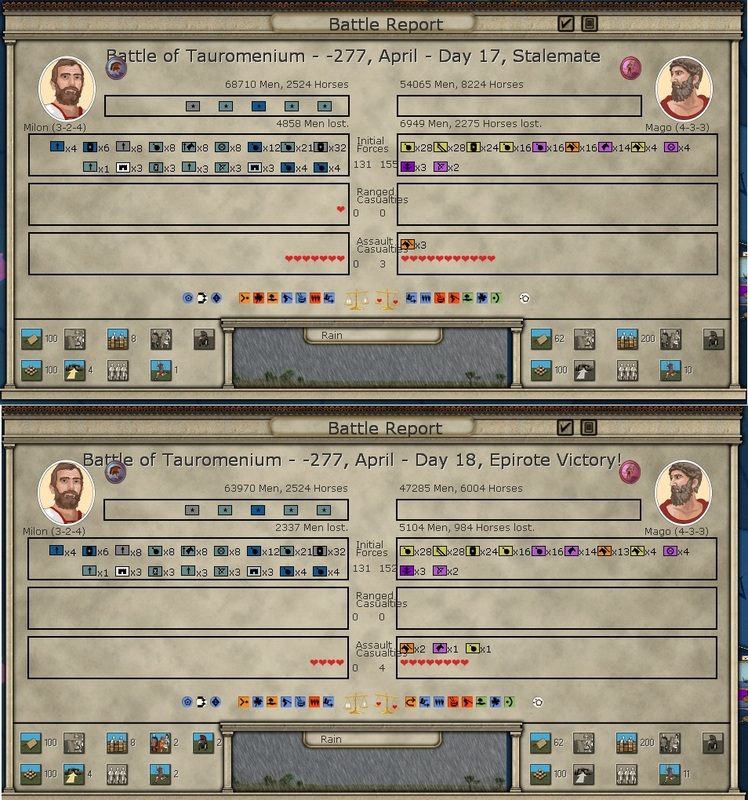 The 9th of March, 277 BC will forever be remember in history as the day of the Battle of Tauromenium, one of the greatest defeats in Carthaginian history! And Pyrrhus can be proud of his son, that's for sure. Yes, if you just look at the casualty list it may not seem so great: "only" a bit less than 5000 Carthaginian men were killed. But look at the encircled number: 34. That means 34 * 500 men were captured in the battle. That's 17.000 prisoners! Wait, what, more prisoners than men at start?!? Ah, who cares about the details, as long as it's a great victory! I have now 22.000 Carthaginian prisoners in total and the Carthaginian Africa army is no more, completely routed. My morale went up by 6 points to 111 and Ptolemeos levelled up again and is now (3-5-4). He rivals his father, at least in offensive skill! Unfortunately I also just noticed that the "brave" trait of Ptolemeos seems to have no effect in the game. In the description it also says "(disabled)". That makes Ptolemeos a bit less great, but since he is still way better than Milon I will of course continue using him. Ptolemeos will now prepare an attack on the Carthaginians besieging Acragas by moving into the province next to it. 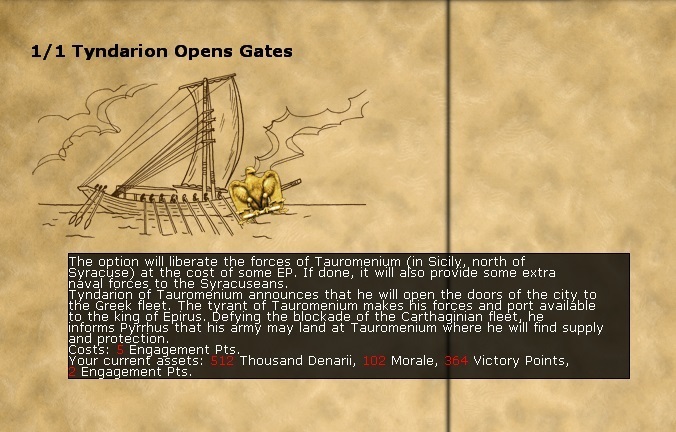 Unfortunately the leader of the Syracusaens, Thynion, has the "slow mover" trait which makes my whole army 25 % slower. As I don't want that, I will split up Thynion and one hoplite unit from the main army so that the rest of the army can arrive in the destination earlier and thus take less movement attrition. I can't leave Thynion at home because I need his Command Points. And leaving a whole unit out of the army is out of the question! The garrison actually held out, and still has a remaining 1400 men + a newly spawned garrison unit. What is very surprising to me is that they actually killed two Roman legion element, one of them even the #1 princeps element, the best fighters of a legion. It's not that important, but it certainly shows that a legion is not invulnerable! If the Romans decide to continue the assault on Venusia then they will be in "assault" posture which means they will not be able to defend. As not only their troops are a lot weaker on the defensive but also their leader is a (3-3-4) and thus better on the defensive, this would be a great advantage for me. On the other hand, the Romans could also decide to just stay in the province in "defensive" posture, leaving the garrison alone. It's propably what I would do. Still, I hope to be able to defeat them in "wooded hills" terrain and clear weather. The third possibility would be of course if they just move away. If they do that, I actually still have the hope that I would be able to catch them as I need only 3 days to reach Venusia. 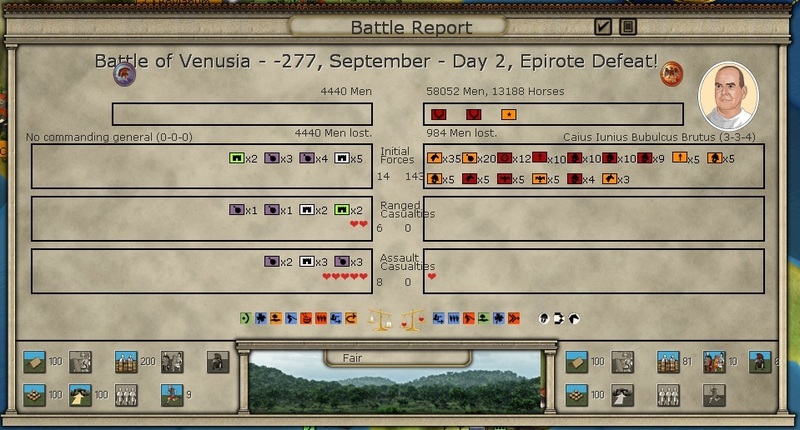 It seems I have celebrated the demise of the Carthaginian army too early. 7500 men remained and there was another battle in Syracuse. Curiously, it is counted as a loss. I don't really know why, I guess because I ordered the army to move out of Syracuse, unknowing that the Carthaginians were still present and only hidden. Meanwhile the other Carthaginian army forced the Acragas garrison to surrender. I had hoped they would hold out another turn but it seems I was too late. This also means that now I can take my time with the counter-attack since I can't save the garrison anyway and will have to siege it myself once I decide to attack. So instead, Ptolemeos will move back to Syracuse to engage the Carthaginian army yet again. It's actually a great opportunity for me to gain national morale, so I won't complain! I am currently at 104. Very unfortunately, as you can see, Brutus cleverly decided to retreat instead, using some Socii troops as rearguard. Yep, that's how the Romans roll for you: use their own troops to sacrifice as a rearguard? No, the despicable Romans just use their allies for it! It's a real shame, I would have love to inflict some real casualties on the Romans! Regardless, I showed the superiority of my army and gained 1 national morale – thereby annulling the loss from the garrison assault a few days earlier - so that's good. For now, Pyrrhus and his army will stay in Venusia. He is not activated so I can't order an assault on Maleventum.